A few days ago we reported that the Lotus company will present at the Geneva show model of Evora, in the creation of which engineers drew inspiration from Formula 1 cars. 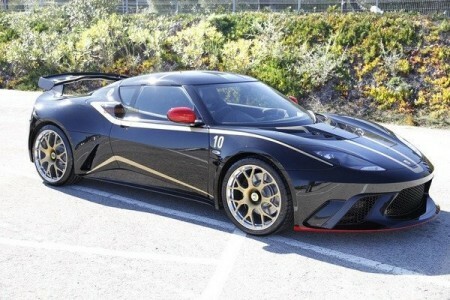 And now Evora GTE F1 pictures appeared on the World Wide Web. Auto pilot team will be on display Lotus, Kimi Raikkonen, who is also willing to answer any questions about the model, which at the moment a lot of melon. One of them concerns an alleged motor vehicle. In terms of the appearance of the situation is cleared up - and all thanks to your photos. Model Evora GTE F1 team using different colors, graphics, and gold discs. In addition to the body will be the number "10", which is the number of Raikkonen and Grosjean this season. The standard model is equipped Evora GTE modified six-cylinder V-twin engine of 3.5 liters and output of 444 horsepower, which makes it the most powerful car Lotus has ever created.